“Ready, lads, ready!” | Shackleton. “The harpooner took the steering oar and, according to his commands, the sailors pulled or back-watered, pulled or back-watered again. “The mother whale did not seem startled at our proximity: she frolicked, turned herself about and raised the little calf, tired with following her, upon her fin. “Captain Jay, his lance poised, waited the favourable moment to strike. The moment came, and the lance transfixed, not the whale, but the calf. “I thought at first that the captain had aimed badly, but soon I comprehended his skill and wisdom. He was aware that the first blow from the lance would not kill the mother, and that she would then fly to a distance and be lost to us; but, by killing the nursling she would be detained immovable, no matter what might be her fate; as mother she would allow herself to be killed on the spot rather than abandon her calf. That is precisely what happened. Captain Jay was able to strike at his leisure, one, two, three, ten blows. The monster floundered, spouted blood, flurried, and died, without moving any farther away than if it had been made fast by the most solid of harpoons. How admirably the power of maternal love dominates the instinct for self-preservation. 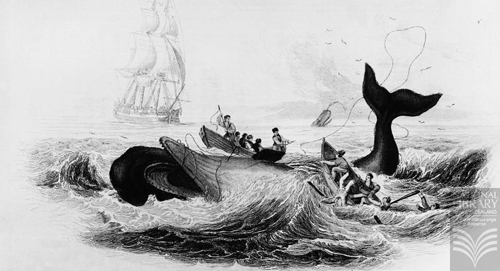 “Thus at last I was able to say I had both seen and touched a living whale, and this in the very height of the combat. So close had I been to it that I was even covered in blood..
“We planted a guidon of ownership in the back of the dead whale and returned on board to prepare the apparatus for raising it, while one of the men climbed the summit of the Olimaroa cliff to give the signal agreed upon, by means of a flag especially erected there, for the boats to return to the Asia. “Part of the day was employed in towing the whale and in hoisting it by the tackle. The Maoris came in crowds to lend our men a hand, and by nightfall the work was accomplished. Scarcely was the last morsel of fat on deck than the native canoes darted towards the floating carcase, which they towed to the strand. It was then a spectacle at once comical and disgusting to see the mob of men, naked and armed with knives, some hanging above the animal’s flanks and others buried within its half-open side, slashing off its flesh in every direction, and choosing enormous steaks, which the women placed on the grass in the rays of the sun.